The Barons and the Lions clash blades in Sunday's fixture. Picture by S Crampton. 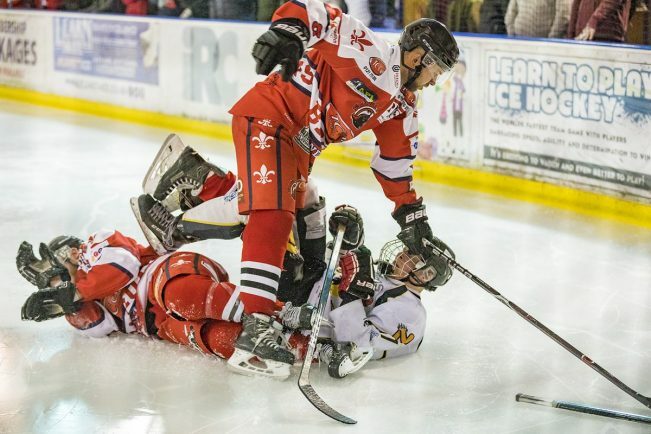 SOLIHULL Barons condemned Nottingham Lions to a second 8-2 drubbing in the space of a week on Sunday, following on from their 4-1 loss away to Billingham Stars on Saturday. Ed Eaton got the scoring underway within minutes of the drop of the puck, drifting his shot beyond the keeper when through on goal, Dan Harrison doubling the lead four minutes later after the Lions were opened up once more. The game became more heated as the period wore on, with Rich Crowe and Callum Medcalf venting their frustrations towards each other, prior to Niklas Ottosson sweeping a devastating shot home from the blue line at the period end. A 23rd minute double salvo saw Elliott Farrell lift a shot over keeper Miles Finney before Matt Maurice added the finishing touch from close range to build a commanding five-goal lead for the Barons. Nottingham would pull one back when Thomas Palmer netted during a powerplay, but the five-goal cushion was soon restored when Maurice again flicked the ball home after Solihull had worked the puck around the ice. Ruskin Hughes dragged a goal back for the Lions when converting from a break-away, though their efforts were seemingly fruitless as the Barons struck again via Stephen Heape on the stroke of the period end. The game would descend into fisticuffs as a number of scuffles perturbed the flow of the final 20 minutes, though Harrison still managed to find an opportunity to put away the only goal of the period when putting away from the right-hand circle. A devastating second period from Billingham Stars the previous night proved crucial as the Barons fell to their hosts. A hat-trick for Kristers Bormanis after Craig Thurston’s opener in the first period settled the tie, with Adam Brittle netting the solitary Solihull goal of the night at 2-0 down. Next up for the Barons is a tough test away to second place Sheffield Steeldogs (7:30pm), before playing host to the Sutton Sting, who sit just behind Solihull in seventh, on Sunday at Solihull Ice Rink (6pm).